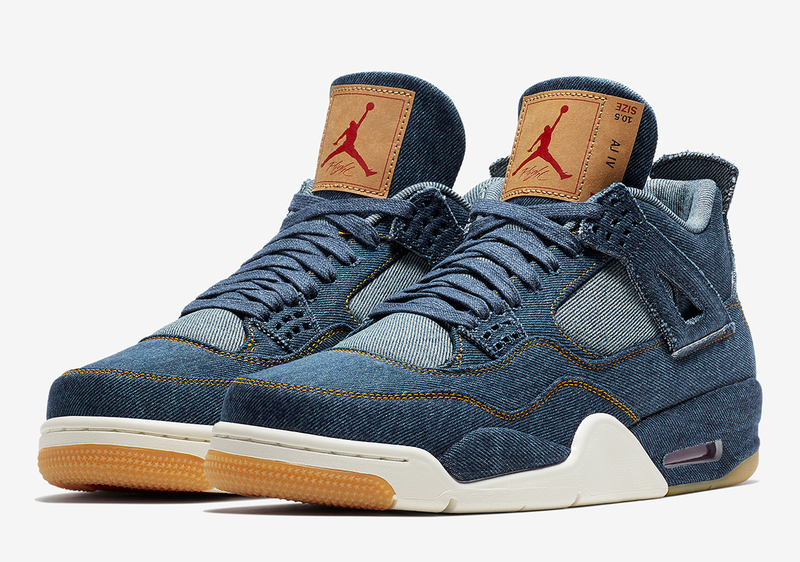 Jordan Brand’s first collaborative effort of 2018 borrows some crazy detailing from the Levi’s brand, dressing up the Air Jordan 4 in denim with its customary gum-colored seam work. One of the most notable details is the left sneaker’s tongue tab that comes with an extra piece of leather on its side that reads “AJ IV” and then displays the sneaker’s size, much like the label of the jeans it replicates, detailing the waist size. Levi’s branding also takes shape on the same sneaker’s insole as well as the company’s signature red tab that attaches to the overlay that usually sits atop the mesh lining of the Jordan 4. Enjoy an official set of images below and check out the Levi’s x Jordan store list for where you can try and secure your own pair for $225 USD on January 17th.